Premium Organic Coconut Milk is a low-calorie and light alternative to cream, sour cream and Co. With a fat content of merely 18 %, Coconut Milk is a real lightweight but still manages to provide us with many essential nutrients. Its medium chain fatty acids can be easily processed into energy by the body which makes it less likely to stay on our hips. Lauric acid is one of those beneficial fatty acids that has an antimicrobial effect and puts an end to many fungi and viruses. And let’s face it: this Premium Organic Coconut Milk tastes simply irresistibly tropical. In addition to all other beneficial properties, coconut milk is lactose-free which makes it ideal for people with allergies. Whether you use it in cocktails, fruit juices or Asian dishes: coconut milk is extremely versatile in use. Vegans and raw food enthusiasts can also enjoy this coconut milk without hesitation. 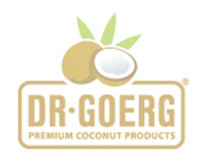 Dr. Goerg Premium Organic Coconut Milk is obtained from monitored organic cultivation and is produced exclusively from fresh coconut flesh. Within 72 hours from harvest to the finished product – that is harvest-freshness at its best! It goes without question that our coconut milk is 100 % natural and does not contain thickening agents, preservatives or any other additives. What it does contain is the milk of three fresh organic coconuts. Creamy coconut milk is the icing on the cake for any dish. Add it to soups, sauces, curries and desserts and enhance mixed drinks, smoothies and cocktails with this luscious milk. Combine it with ananas, mango other fruit juices to add an exciting flavor to your cuisine. Coconut beginners and seasoned enthusiasts alike can let themselves be inspired by our collection of recipes. Give it a try and have a look at our recipe section .